The Shoulder is a very complex joint mechanism and there are numerous ways in which we can upset the fine balance that separates a non symptomatic shoulder and a symptomatic shoulder. A vast majority of these injuries will settle spontaneously, or with some minor help from a Chartered Physiotherapist, but in those rarer cases, where surgery is needed here are some of the more common types that we see.. The shoulder girdle is a complex yet sophisticated joint that allows the upper limb to function from anything involving basic everyday tasks to carrying out, for some individuals, the strength and mechanism to undergo heavy manual work or high end sports performance. It is often considered one of the more challenging parts of the body, with regards to rehabilitation, which is why many patients approach us when they need to be guided safely through this process. As clinicians we aim to appropriately manage our patients before and after injury, or surgery, in order to return you to YOUR chosen activities, achieve YOUR goals, and return to what is important to you, in YOUR life. View of the shoulder joint showing the main bony involvement and 'space' that can be compromised by bony growths (osteophytes) or thickened bursa. One of the most commonly seen surgical interventions we see in the shoulder is a procedure called an Arthroscopic Acromioplasty, or Subcromial Decompression (SAD). Like any surgery, this may only be necessary when other conservative methods of treatment have not been successful. This keyhole surgery (tiny incisions for camera and tools to minimise surgical trauma) involves the removal of a small amount of bone, sometimes referred to as a bony spur or osteophyte, by shaving the underside of the acromium (the top bony process of the shoulder blade that forms part of the shoulder joint). The primary aim of the SAD is to make the joint space bigger for the supraspinatus tendon to slide through as the arm is elevated to the side, which when compressed and irritated, can give rise to pain locally on the side of the shoulder joint and the outside of the upper arm. With painful shoulder conditions such as tendinopathies, there is likely to be a lot of diffuse inflamed tissue around the primary injury site, including the bursa (a membranous sac located between tendons and bony prominences aimed to reduce friction and lubricate motion). 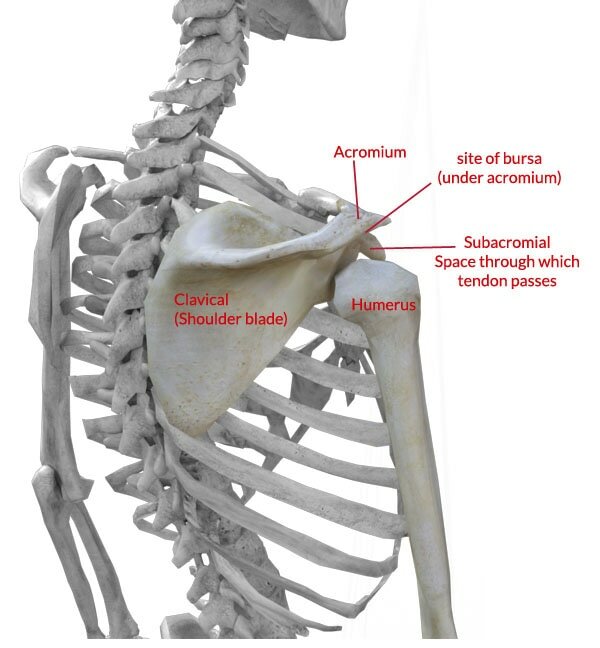 There are a number of bursa within the shoulder joint, the largest being the subacromial or subdeltoid bursa. When irritated, or injured, this bursa may thicken and cause additional narrowing within the joint, contributing further to impingement when elevating the arm. In this instance the inflamed bursa can also be removed during the procedure. ​During a keyhole procedure the Rotator Cuff (RC) tendon may be repaired or debrided (trimmed) if necessary. The rotator cuff is a small group of muscles (Subscapularis, Supraspinatus, Infraspinatus & Teres Minor) that surround the shoulder joint giving its stability and strength when moving the arm. The tendons from these muscles arise from the scapula (shoulder blade) and insert into the ball of the humerus (upper arm bone) to form the ‘cuff’. 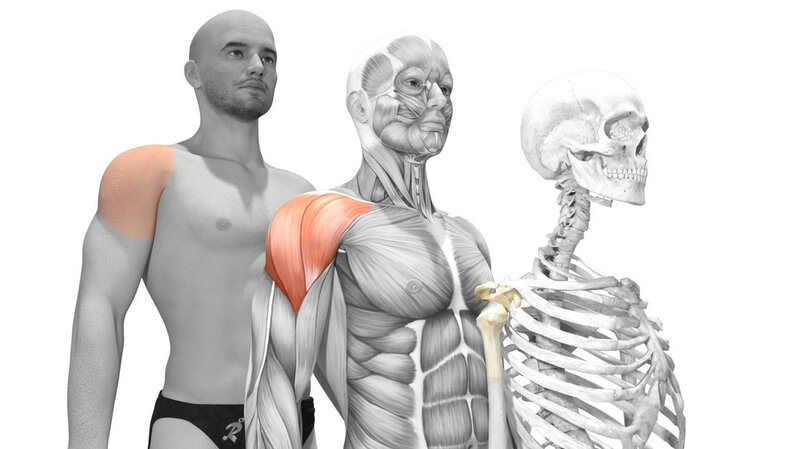 Although this collection of muscles are small they can be responsible for a large amount of pain. A tear in the rotator cuff is most common over the age of 40 years and can occur following tendinosis where the tendon has become inflamed and damaged. This could possibly be due to overuse or sudden increase in activity; such as a spell of gardening with a turn of nice weather or a skiing holiday when normally the individual has a sedentary lifestyle. Some tears can occur due to trauma/injury and in a younger person this would almost always lead to a surgical repair to avoid tendon retraction, muscle wastage and stiffness with loss of joint range and function. Research shows more than 50% of over 60 years old have at least a partial thickness tear of the rotator cuff which has significant impact on their quality of life. If there has not been a response to earlier interventions such as injections or physiotherapy input with exercises for gaining range and strength, then a repair may be indicated. Most repairs can be done arthroscopically (see subacromial decompression) but in some more complex cases an open incision may be necessary and will be determined by the orthopaedic surgeon. ​Frozen shoulder, or adhesive capsulitis, is a very painful condition that can result in a loss of shoulder range and function. The condition involves thickening, contraction and adhesions of the capsule of the shoulder (a sheet of strong connective ligament tissue wrapping around the ball of the shoulder joint aimed at giving the joint part of its stability). When this capsular tissue becomes inflamed, thickened and tight, it can adhere to the humeral head (ball of the shoulder joint) and cause a loss in the movement of the arm. This commonly leads to people being unable to carry out basics tasks such as combing the back of the head, do up a bra strap or even reach up above their head. This condition may be associated with other soft tissue pathologies such as rotator cuff injuries, dislocations, traumatic arthritis or diabetes, or in many cases the cause can be unknown or insidious with no known cause. If necessary a manipulation under anaesthesia (MUA) is performed on people with a simple frozen shoulder to free up the shoulder by manipulating it to achieve the shoulder range. For other more chronic cases it may be necessary to undergo a keyhole procedure called a capsular release where a special radio frequency probe is used to cut and remove thickened tight tissue to free the joint. For someone with a very arthritic shoulder joint who is in a lot of pain with significant loss of function it may be necessary to undergo a replacement of the joint. This is where the damaged bony parts are removed and replaced with artificial components called the prosthesis. The shoulder can suffer several types of arthritis and this would determine which type of replacement is needed. In arthritis involving degeneration of the rotator cuff muscles a reverse shoulder replacement may be performed which gives the joint more stability when the muscles are too weak or damaged to do so. Following shoulder surgery the arm will be in a sling for approximately 2-3 days following an SAD or could be up to 4-6 weeks following a RC repair and this will depend of the procedure carried out, the extent of the repair and the surgeons preference. Physiotherapy will be commenced immediately to start exercises for moving the arm with instructions on how much movement to achieve initially, again dependent on the surgeons instructions. With a SAD the exercises will be aimed at achieving movement above the head as soon as possible but with an RC repair this may be restricted in the early weeks with gradual increments in range as pain and surgeon protocol determine. Following an MUA or capsular release the physiotherapy input is to work on exercises and manual therapy aimed at stretching the arm to achieve full normal range as soon as possible. Following a shoulder replacement the arm would be in a sling for approximately 4-6 weeks and physiotherapy would commence immediately for exercises for gradual movement and strengthening as well as soft tissue manipulation to aid recovery of scar tissue. The initial recovery period is around 6-8 weeks for recovery from surgical pain but it can take anything up to 6 -12 months to achieve full strength and benefit from the new joint. At Team rehab we are committed to helping you, following surgery, to return to function, beginning with everyday tasks to eventually returning to work and/or hobbies. Our team have significant experience in working with most of the orthopaedic surgeons across the whole of Northamptonshire who carry out all the procedures mentioned above as well as other less common procedures, and are able to guide and assist you in the necessary steps of rehab. Achieving YOUR specific goals is our main aim and we focus on setting these goals early and work with each individual to gradually gain movement and strength, allowing you to get back to normal activity and make it worthwhile having gone through a surgical procedure. ​We have close links with local hospitals, surgeons and GP’s and can liaise readily with both your surgeon and other members of the medical team at any stage if necessary. We aim to provide up to date, accurate, information to patients (not fake new for personal gain) so please like and share this page, across your social media, so others can benefit as well.